Saudi Crown Prince Mohammed bin Salman, right, meets with U.S. Secretary of State Mike Pompeo at the Royal Court in Riyadh, Saudi Arabia, Jan. 14, 2019 (Pool photo by Andrew Cabellero-Reynolds via AP Images). For many decades, shared fears of common enemies—from the Soviets to the Iranians, Saddam Hussein and extremist movements like al-Qaida and the Islamic State—pushed America and Saudi Arabia into an uneasy embrace. But today that calculus is no longer enough to sustain their alliance. 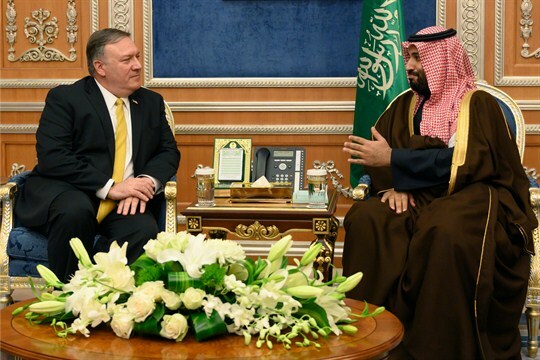 For the United States, the strategic costs of the Saudi relationship have come to outweigh the benefits, as the tensions and unnaturalness of the partnership make it increasingly intolerable.